'Evening dresses' have always been problematic for me; I don't really separate between day- and evening- wear. I wear a high quality buttoned blouse with a pair of jeans in the morning, and the same blouse can look fantastic in the evening with a skirt and the right accessories. Almost every dress I've designed can work great in the evening with the right shoes and purse. 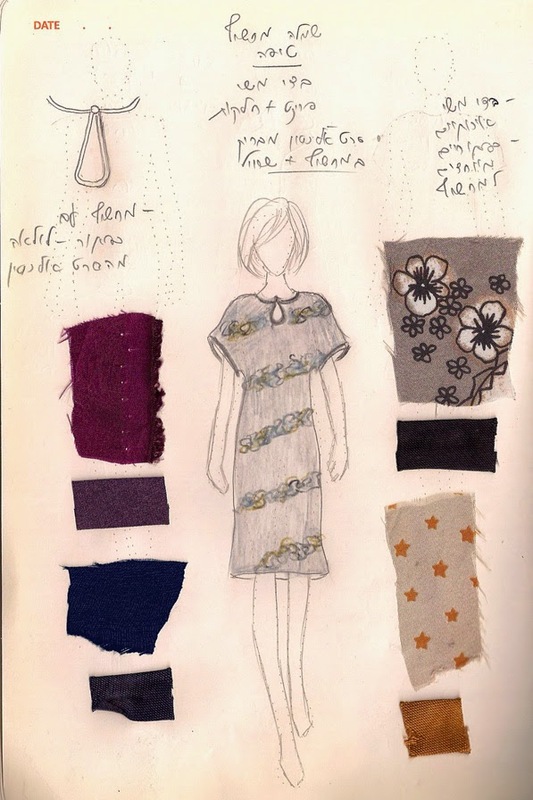 But this time I decided to design a dress made of unique high quality silk fabrics that could make a perfect evening dress for a night out or for a special occasion. The Drop Neckline Dress, made of grey toned silk with a delicate flower print, falls loosely, almost straight down, on the body with a gentle curve around the waist and a gentle A-shaped widening in the bottom. It has a bat-style sleeve and a drop shaped neckline, closed by a unique button. A narrow black satin band highlights both the neckline and the sleeves. When I wore it for the photos I felt light and calm. When I go out, I don't want to fuss over my clothes all the time. The dress also comes in: plain purple, cream with tiny stars, and plain navy blue. You're more than welcome to visit my boutique!